It seems like the Christmas creep starts earlier every year. You know what we’re talking about — it’s when a holiday tree goes up in a shopping mall before Halloween, or how Christmas candy is front and center at every drug store you go into on Nov. 1. While we can’t say we hate Christmas cheer brightening up our day in November, there has been one Christmas creep fad that’s becoming more and more common as the years go by that isn’t something we can get behind. We’re talking about retailers staying open on Thanksgiving so that Black Friday can start early. But for every five retailers that decide to stay open to cash in on good ol’ American commercialism, there’s at least one that shuts its doors so that employees can spend time with their loved ones — and shoppers can relax at home on Thanksgiving without worrying that they’re missing out on sweet holiday sales. 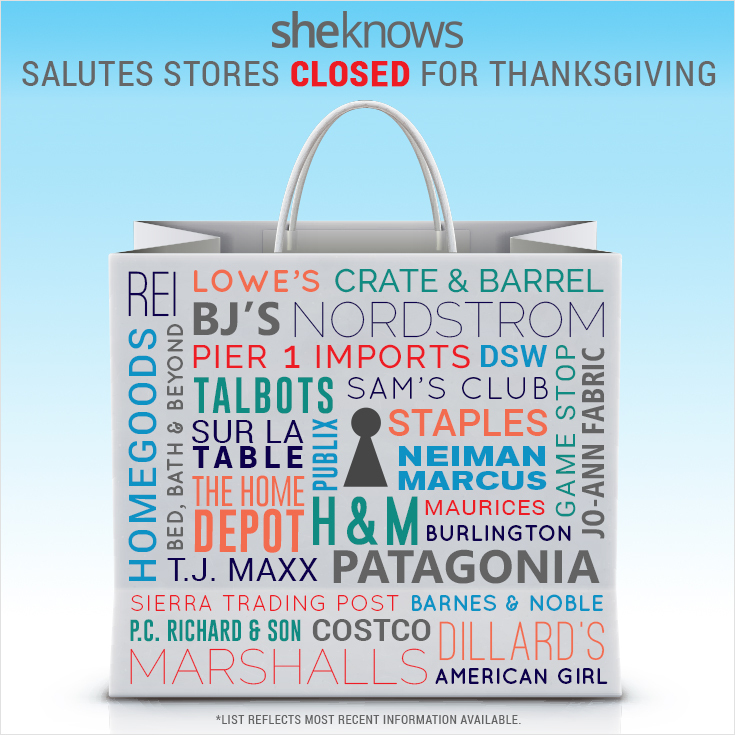 Some of these are retailers that have opened in past years but have decided to close on Thanksgiving to honor their associates. 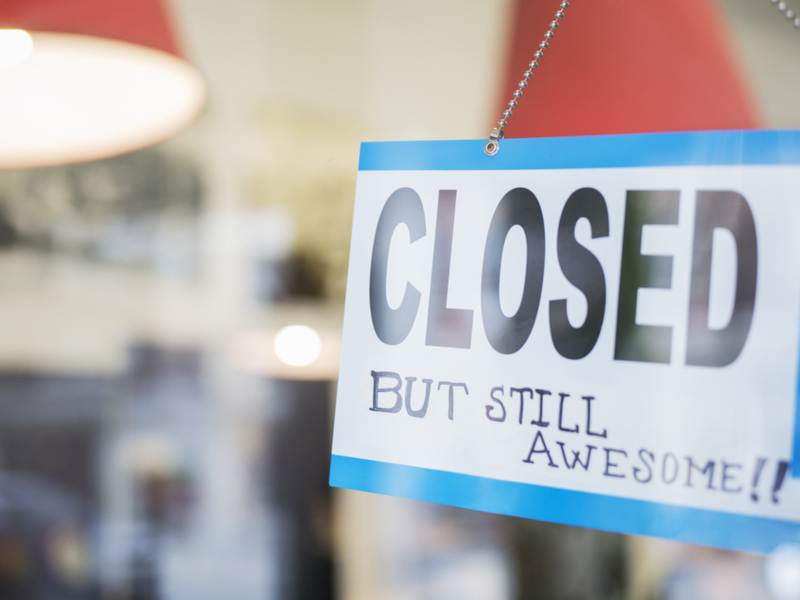 Others have never opened on Thanksgiving, and they’re taking a firm stance that opening on Thanksgiving Day isn’t appropriate. Here’s a list of the stores that have announced that they will not be open. 1. T.J. Maxx — “We consider ourselves an Associate-friendly Company, and, we are pleased to give our Associates the time to enjoy the Thanksgiving holiday with family and friends,” a company spokesperson told ThinkProgress in 2014. The store will be continuing the tradition in 2016. 2. Home Goods — This store is owned by the same company as T.J. Maxx and won’t open until 7 a.m. on Friday. 3. Marshalls — Like its sister companies (above), this retailer will have shuttered doors on Black Thursday and is expected to open at 7 a.m. on Friday. 5. American Girl — American Girls stores are closed on Thanksgiving Day, but open on Black Friday, per their website. 6. Dillard’s — The store has traditionally shuttered for Turkey Day, but opens early on Black Friday. 7. Burlington — Want a new coat? Don’t expect to get one until Friday morning. 8. REI — They won’t open on Black Friday either. The company would rather everyone #OptOutside than spend the day shopping in harried crowds. 9. Costco — According to the store’s hours, it’s closed Thanksgiving, Christmas and New Year’s Day. They re-open for Black Friday at 9 a.m.
10. GameStop — “We believe strongly that our customers and associates should have the opportunity to spend the Thanksgiving holiday relaxing with family and friends, and not worrying with the stress of where to find the best shopping deals,” said executive vice president and president of U.S. GameStop stores Mike Buskey in a statement last year, via the company website. .
11. Maurices — Maurices closes its doors on Thanksgiving Day, but most locations open bright and early at 6 a.m. on Friday. 12. Patagonia — In a bold move for a retailer, the store encourages people not only to stay home on Thanksgiving but to avoid Black Friday too. 14. H&M — Most H&M locations remained closed for Thanksgiving Day, but are open for Black Friday. 16. Staples — “We want our customers and associates to enjoy Thanksgiving their own way,” said Demos Parneros, Staples president of North American stores and online, in a 2015 company statement via CNN Money. 17. Sam’s Club — Although Walmart, its sister store, will be open all day on Thanksgiving, there will be no stocking up on jumbo tubes of toothpaste after your turkey. 18. Sierra Trading Post — Owned by the same company as T.J. Maxx, Sierra is expected to open its stores at 5 a.m. on Friday. 22. Nordstrom — The retailer has never opened on Thanksgiving and doesn’t plan to start this year. 23. BJ’s — It’s clear in big red letters on this store’s schedule: It will be closed. 24. Jo-Ann Fabric & Craft — The craft store is continuing a tradition of staying closed on the big day. 25. DSW — “We have the best employees, and we’re saying thanks to them again this year by giving them the time to celebrate Thanksgiving with their loved ones,” the company wrote in a 2015 Facebook post. They plan to stay closed again in 2016. 30. Cabela’s — Cabela’s stores are closed on Thanksgiving, but they still invite you to shop their Thanksgiving Day Sale online. 31. Craft Warehouse — They’re closed Thanksgiving Day, but open early and stay open late on Black Friday. 33. Dress Barn — Most Dress born stores are closed, but check your local outlet for holiday hours. 35. Tractor Supply Co. — Per their website, Tractor Supply closes its doors every year for Thanksgiving.